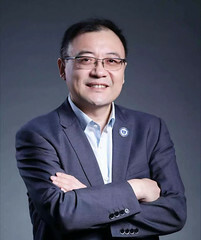 Post written by Ping-Hong Zhou, MD, PhD, from the Endoscopy Center and Endoscopy Research Institute, Zhongshan Hospital, Fudan University, Shanghai, China. We aimed to explore the characteristics, predictors, and management approaches of intraprocedural mucosal injury. As the mucosal flap is the only barrier between the mediastinum and esophageal lumen during per-oral endoscopic myotomy (POEM), mucosal injury may lead to contamination of the submucosal tunnel. In fact, mucosal injury is considered a critical perioperative adverse event of the POEM procedure and has been shown to occur with an incidence of 1.6% to 25.8% in various published series. The assessment of predictive factors can be crucial for the prevention of intraprocedural mucosal injury. Our results demonstrate that mucosal injury during POEM is common with a frequency of 17.7%, while type II mucosal injury, which is defined as large, full-thickness perforations that are difficult to repair, is relatively rare with a frequency of 1.7%. In addition, type II mucosal injury had more significant adverse events than did type I mucosal injury (12.8% vs 5.4%). In further exploration of predictors, mucosal injury was independently associated with previous Heller myotomy, previous POEM, submucosal fibrosis, mucosal edema, and tunnel length ≥ 13 cm. However, only previous POEM and submucosal fibrosis were significant predictors of type II mucosal injury. POEM performed after the learning curve had relatively lower risk of mucosal injury. These findings can be used to assist endoscopists in the decision of referring cases to senior endoscopists when treating patients with high-risk of mucosal injury during POEM procedure. Our study does have limitations, as it was conducted in a tertiary referral center with experienced endoscopists, and the data were studied retrospectively. However, we addressed a critical adverse event that can directly affect the main principle of third space endoscopy, which is maintaining the integrity of the mucosal flap during the tunneling procedure. We believe that the present findings represent the leading reference for assessment and management of intraprocedural mucosal injury in a clinical practice. As submucosal tunneling endoscopy has stretched to new tissues and areas of the gut, the interventional endoscopists have to be even more careful. That requires not only the operative capacity but also the ability to anticipate, assess, and manage risk. Figure 2. 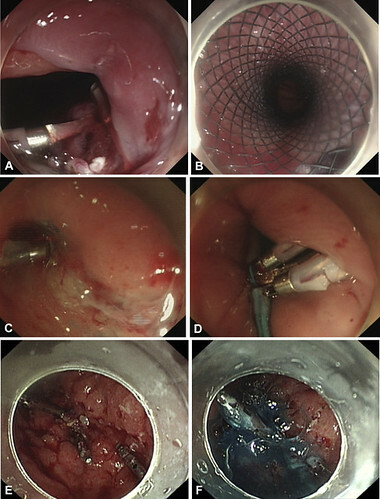 Different closure approaches for mucosal injuries during per-oral endoscopic myotomy. A and B, A large perforation at the cardia that was difficult to close by endoclips was managed using a fully covered self-expanding metal stent (type II). C and D, An irregular partial-thickness submucosa exposure lesion was closed by endoloop (type II). E and F, Fibrin glue was used for unsatisfactory endoclip closure of multiple scald and partial-thickness mucosal injuries (type II).